Prayer is so great an issue that it is even one of the three points of the “status quo” regarding the Temple Mount: that all non-Muslims are forbidden to pray or show any religious expression on the Temple Mount. (This is the ridiculously absurd “reason” Jews are getting arrested for praying or prostrating themselves up there). Prayer is also a main sugiya, or issue, of this week’s parsha, Parshat VaEtchanan (literally, ‘and I will beg/beseech’). Moshe Rabbenu prayed 515 prayers to enter Eretz Yisrael and never got in. One more prayer was needed to enable him to enter the Promised Land. But Moshe prayed! This also leads right in to the mega issue of a million and one Whys – why do the righteous suffer and the wicked enjoy life, why if one prays at the chupah for shalom-bayit does s/he end up divorcing, why if one prays for healthy children are handicapped babies born, or, chalila, do parents lose a child, why oh why??? Even Moshe couldn’t help himself and asked a few Whys before the ten plagues hit Egypt. This, then leads to yet another huge sugiya of Free Will versus Predestination (way off the scope of this little post). Tied to this, though, is the point that Hashem stopped Moshe from saying that last prayer needed, being No. 516, that would have got him in. Plus, the Talmud provides lists of those whose prayers are not heard and why, making this whole topic that much more complicated. Just a few days ago, during this week’s parsha, on Tisha B’Av, a video clip of the girls of Gush Katif crying and praying in earnest popped up on my newsfeed. That, with other things, really helped me put myself in the proper mindset to daven, so I also shared it. The vast majority of the dozens of responses from all the groups I shared to were likes and hearts. Many also shared, and even commented how it made them cry too and be in the spirit of the day. Two comments, however, scoffed at it saying ‘It didn’t help then’ – that is, prayer ostensibly did not help in the case of Gush Katif. My answer then was basically: “We use their pray of then for now – because it’s all part of the same spiritual galut we’re in. It’s hardly just the loss of Gush Katif. Tefillah helps – it helps on Hashem’s terms and time. It’s not like a candy machine where you put in your coin, press, and receive what you want – the list is very long – from the destruction of our first Temple, Second, etc.” This, however, is just a drop in the bucket on the issue of prayer. Prayer is not the opposite of action or hishtadlut. Read through the Tanach at all the times we took action without Hashem’s okay and blessing. For one, look at what happened to one of Am Yisrael’s all-time best warriors – King Saul. The 12th of the 13 Principles of Faith of Judaism that the Rambam listed is: “I believe in complete faith in the coming of the Mashiach, and even if he tarries I will continue to wait for him every single day that he will come.” From other sources we learn that teshuva and messirut nefesh – on the part of the individuals of Am Yisrael – are the determining factors for the geula and Mashiach’s arrival. So, we pray and wait, but we still have personal spiritual work to do to affect our wish. Moreover, how to pray is a skill. We learn how to pray primarily from Leah and Channa. A good deal of Chassidism is about teaching how to pray. There is a plethora of books on prayer, including Rebbe Natan’s book of prayers, Likutei Tefilot, that he formulated for each of Rebbe Nachman of Breslev’s teachings in Likutei Moharan. So, this article will hardly exhaust the subject. Yes, there is a level of interaction between mankind and our Creator, but in the end, it is the Creator Who runs His world and according to His Plan. The Tzaddik of Yavniel used to say in his drashot that the 516th prayer that was lacking was the prayer of the Am – the Am’s collective prayer that Moshe be allowed into Aretz. What this implies on the one hand is that there is a required number of prayers needed, as it also shows persistence and the need for persistence in faith of prayer, while on the other hand the number is like an aptitude test score, indicating that Am Yisrael had not yet attained the appropriate level of consciousness needed to enter the Promised Land with Moshe Rabbenu. The number per se then is less important – although 515 is important, as noted being the gimatria (numerology) of VaEtchanan – than the real issue at hand: Hashem is trying to bring his non-robotic human part of creation to a certain level of spirituality and consciousness. The issue of our collective level of consciousness is really closer to the real answer regarding the Gush Katif disengagement too. It was more about the displacement of faith. Before WWII, for instance, no one would or could have believed that the “cultured” Germans were capable of doing what that actually did. (I could get really into this and also go back to the limuds about how Adam (so-to-speak) dipped into evil, because he didn’t think or know just how evil evil is). After the Holocaust, our collective consciousness was different. The whole time from when they were just talking about or threatening to evacuate Gush Katif, until the actual D-Day, no one in Israel – but NO ONE! – believed it could actually happen, especially since Ariel Sharon was PM. There was this kind of displacement of faith that Sharon was some kind of Mashiach who would look after and save Am Yisrael on Eretz Yisrael. The left we know is just too eager to give away land of Aretz and stand by the enemy. The right is not so obvious. Yet, look at what Sharon did. Look at what Bibi has done with the Temple Mount and how he is still ready to give away the “northern triangle”. Plus, although he’s made statements that we’ll never give up the Golan, he has yet to make such a statement with regard to Judea and Samaria. People are slowly but finally waking up to the reality (as our Sages warned us how it would be in this era) that we are under the rule of the Erev Rav. The allegiance of the Erev Rav is not and has never been with Israel – the Nation, the Land, and the Torah thereof – at all. They all keep wanting to please the nations of the world, and that’s their priority. The Torah has some basic requirements for who can be a leader of Israel (Shmot 18: 21), and no one in the Knesset – religious or not – seems to fit the bill. So, there’s a displacement of faith that this government can “save” us from all our problems. There isn’t a single action (or omission) that they can do that will do the trick. Real faith is knowing that only a rule by Torah and by leaders who measure up according to the requirements of Torah and who lead only according to Torah – only that is the answer. The Solution: King David on his death-bed instructs his son, the new King Solomon, “And you shall keep the guard of God your God to go in His path and to keep His statutes, His commandments, and His laws, and His testimonies, as is written in the Torah of Moses, in order for you to be educated in all that you do and to all where you turn” (I Kings 2: 3). The Authority = God Himself: “If in My statutes you walk and My commandments you keep and do them, then…you will dwell in your land in SAFETY [and]…I will give PEACE in the land” (Vayikra/Leviticus 25: 18 and 26: 1-6). The Proof: “And [King] Solomon was ruler over all the kingdoms from the river of the land of the Plishtim and unto the border of Egypt…from Tifsach to Gaza, over all the kings on this side of the river, and he had PEACE on all sides around him. And Judah and Israel dwelt in SAFETY, every man under his vine and under his fig tree, from Dan to Be’er Sheva, all the days of [King] Solomon” (I Kings 5: 1, 4-5). How did King Solomon do it? He ruled according to Torah. Faith needs to be in Hashem and His Torah only. One example of when faith, and with it prayer, are properly “repatriated” occurred during the first war in Gaza. A few YouTube clips recorded the interviews of the soldiers who witnessed the miracle, and the main IDF soldier involved, Avner Azulai, was called in to tell his story in person to the late Rav Ovadia Yosef. 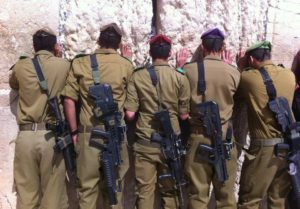 Basically, these soldiers were supposed to storm a key building in Gaza when suddenly what looked like a religious Jewish woman appeared and warned them that the entire building was booby-trapped. After that, she kept appearing and warning soldiers not to enter certain buildings, and sure enough, minutes after her warning, the whole building would explode. After seeing three buildings blow up like this after her warnings, Azulai asked her who she was. She answered, ‘Imma Rachel’ (Rachel our Matriarch). He then mustered up the courage to ask her by what merit he and his unit were saved by her appearances and warnings. Her answer was that all of the prayers together that Am Yisrael prays are what enabled her to be sent to warn them. The “voice of Jacob” – this is edge we have over all of our enemies.